The language used by our people in the Liturgy is called Church- or Old-Slavonic. It is called Church- Slavonic, since its use is limited to the Church for the liturgical services. It is also called Old-Slavonic, since in former times it was the common language of Slavic tribes. Some Slavists refer to it as the "Old-Bulgarian" language, but incorrectly. The Slavonic language was introduced into the Byzantine liturgy by the Apostles of the Slavs, SS. Cyril and Methodius, during their missionary activity in Great Moravia. The missionary brothers were sons of a high ranking officer (Gr. "drungarious") Leo, who was attached to the governor of the Macedonian province. During the eighth century this whole province became occupied by the Slavic tribes. Thus SS. Cyril and Methodius were familiar with the Slavic dialect as spoken at that time in Macedonia. "Being still pagans, the Slavs did not have their own letters, but read and communicated by means of tallies and sketches. After their Baptism they were forced to use Roman and Greek letters in the transcription of their Slavic words but these were not suitable ... At last, God, in his love for mankind, sent them St. Constantine the Philosopher, called Cyril, a learned and upright man, who composed for them thirty-eight letters, some (24 of them) similar to the Greek, but some (14 of them) different, suitable to express Slavic sounds" (cfr. E. Sabov, Khristomatia, Ungvar 1893, p. 174-175). "JEVA (N) HELIE OT LUKI"
Having devised the Slavic alphabet, St. Cyril, along which his brother and disciples, began to translate Liturgical Books and excerpts from the Holy Scriptures, which he brought with him in Moravia in 863. The literary work of both brothers was indeed a wondrous and far reaching event in the religious and cultural life of the Slavic peoples, especially those who retained the Cyrillic alphabet and the Byzantine-Slavonic Rite. We consider the literary work of SS. Cyril and Methodius sacred, since it was motivated by a most sacred cause, namely, the evangelization of the Slavic peoples, a magnanimous response to the sacred commission of Christ: ''Preach the Gospel to every creature" (Mr. 16:15). It was done not without God's assistance, as we read in Constantine's Life: "The Philosopher (i.e. St. Cyril) withdrew and, according to his custom, had recourse to fervent prayer with his several companions who shared his ideas. Presently God, Who always hears the prayers of His servants, revealed to him what he desired to know. At once he formed the letters and proceeded then to write the words of the Gospel in Slavonic: 'In the beginning was the Word' (Jn. 1:1)." Pope Adrian II ascribed the invention of the Slavic letters to the "grace of God and the intercession of St. Clement" (cfr. his breve "Gloria in Excelsis," of 869). The invention of the Slavic letters and introduction of the Slavonic language into worship could be considered a genial work, a real miracle, since it surpassed all the literary attempts made in the Middle Ages. We have to bear in mind that the literary work of the brothers was revolutionary, for which they suffered humiliations, persecutions and even imprisonment. By introducing the Slavonic language into the divine worship, SS. Cyril and Methodius infuriated the powerful and very influential Frankish clergy, and lost the support of the Prince. And yet, these two dedicated missionaries, who did not even belong to the Slavic people, were able to fashion a literary language for the Slavs, which until today is our common heritage and pride. Even non-Slavic linguists, experts in comparative philology. cannot find adequate words in in praise of the beauty and perfection of Slavonic, admiring its flexibility, nuances and force of expression. They unanimously agree that "the greatness of the Slavonic language, even from the standpoint of philological workmanship. can not be surpassed" (cfr. Van Wijk, Nahtigal, Brueckner, etc.). A great admirer of SS. Cyril and Methodius, the Rev. Francis Grivec, University professor in Zagreb, Yugoslavia, wrote an entire '"Meditation" on the excellence, sacredness and geniality of the Slavonic tongue, concluding: "The whole Old-Slavonic literature, not only by its origins, but also by its contents is entirely Christian and spiritual. Therefore, not without foundation, the linguists call it a Church Slavonic language" (cfr. Acta Academiae Velehradenis, Olomouc 1947, p 75-84). The Old-Slavonic language, as it was devised by the Apostles of the Slavs, underwent some changes and morphological modifications during the course of centuries. 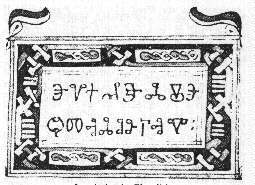 First of all, the elaborate (glagolitic alphabet was simplified by one of St. Cyril's eminent disciples, probably the presbyter Constantine. He called this new alphabet Cyrillic, in honor of his inspired teacher. Thus, during the tenth and eleventh centuries a more practical and simpler Cyrillic alphabet came into common use. It is the very same alphabet used in our liturgical Books even today. At the beginning of the eighteenth century, the Cyrillic alphabet was simplified even more by the Russians and somewhat modified according to the exigences of the spoken language. In 1713, Czar Peter the Great, ordered its use in all "civil (hrazhdanski") matters, hence it was called the Civil Alphabet ("Hrazhdanka"). The Civil alphabet spread from Russia to other Slavic peoples. Thus today we have, really, two Cyrillic alphabets, one-Church-Cyrillic, used in Liturgical Books and another-Civil-Cyrillic-Alphabet, used for profane purposes. In our churches the Rusyn type of the Slavonic language is used, as it developed in Kievian Rus'. It took its definite shape in 1619, when Meletius Smotricky published his famous Grammar of the Church Slavonic language. "Ready, at last, is the Bible, namely the Books of the Holy Scriptures, published in our Rusyn language (in fact--in Church-Slavonic)... If you will diligently read it and explain it to the people, you will not only guide them toward the knowledge of the truth, but also you will preserve and strengthen our native tongue, literature, nationality and religion" (cfr. his Pastoral Letter, in Naukovyj Zbirnyk, Svidnyk 1967, p. 213- 241). From the above quotation we can conclude that our great Bishop Andrew Bachinsky (+1809) still identified liturgical language with literary language, calling the Church-Slavonic our native and national tongue. Another example is the Rev. Michael Luchkay's "Grammatica Slavo-Ruthena," written in Latin and published in Budapest, 1830. In the Preface, Luchkay affirms that our spoken language differs from Polish, Bohemian or Russian, therefore, we should accept as our literary language Church-Slavonic, which "is considered to be our native language, easily understood by other Slavs" (N.B.-Accidentally, I discovered Luchkay's Grammar of 1810 in the Chicago Public Library). It was only during the period of our re-awakening, after 1848, that our writers began to introduce the spoken language into our literature (for the various samples of our language cfr. Sabov's Khristomatia). Due to the super-conservatism of our clergy, who lacked education in their native tongue, the influence of Church-Slavonic on our literary language remains strongly felt until this day. What a pity that such a great treasure, our Church- Slavonic language, is completely neglected in our parochial schools. No wonder, that with the language, our Slavonic Rite also becomes neglected and obsolete.